By Marguerite Ward for BreakThru Radio on October 3, 2013. Mobile technology and the innovative apps tailored to it have made ordinary people into experts on their own life experience. Whether it’s to lose weight, keep track of mood changes, or organize all data on your communications – inventive thinkers have developed tools to help regular smartphone users learn more about themselves and improve their lives. 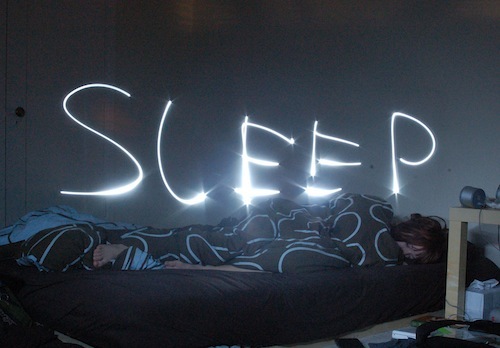 One new app, SleepArt, takes the quantified self movement to a whole new level. Without even being awake, a person can now collect, analyze and create visual data on their sleeping patterns by enabling a smartphone app. While most sleep-related apps require a person to input their desired bedtime or wake up time, or to rate how they feel in the morning, SleepArt determines the quality of your sleep without requiring any actual data typed into the app. It is available for the iPhone 4 and up and select versions of the iPad. Exploring the unconscious realm of sleep has occupied curious minds for thousands of years. Theories on sleep date back to 500 B.C, when ancient Greek philosophers started tracking and researching sleeping patterns and behaviors. And now today, a smartphone app enables people to track and visualize their sleeping patterns. This is a feat ancient philosophers could only dream of. So how exactly does SleepArt work? First, you plug in your iPhone to save battery, set a SleepArt alarm, and then place your iPhone on your mattress. Using the device’s built-in sensors, the app is then able to track movements and sounds – which is automatically turns into artwork. 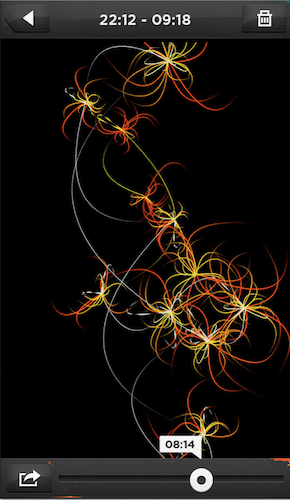 When the alarm rings, you awake to an artistic depiction of your nights sleep. A drawing in green or blue indicates a restful nights sleep, while a drawing in yellow or red indicates many sleep disturbances. The user then has the option to playback how the art was created, so you can see a minute-by-minute breakdown of your sleep. The app also allows you to save each night’s data so you can compare it over time. But for many, the app can be bewildering. Many Apple Store reviews express confusion over how to interpret the SleepArt visuals. For those who learn how to interpret the visuals, posting SleepArt visuals on social media can be an interesting way to share information, or at least an artistic graphic with friends and family. A big part of the quantified self movement is self-improvement. By sharing our problems, experiments to fix those problems, and successes – the theory is that quantifying the self can help not only the user but those with whom they share. From posting app-generated Facebook updates about our marathon training to tweeting about successful relaxation tips, many more people are involved in the quantified self movement than those who declare themselves a part of it. In a subtle way, the SleepArt app encourages sharing information of your quantified self – by enabling users to tweet, Facebook or email about their sleep. Apps like SleepArt make the quantified self movement more accessible, and thus more pervasive in our daily lives. It’s productivity while you sleep. But apps like SleepArt also beg the question, will people take the quantified self movement too far? If we’re tracking ourselves while we sleep, do we ever really tune out from technology? Is simply sleeping the same as sleeping simply? You can be the judge. Are you a sleep artist? Let us know what you think @BreakThruRadio. Tags: BreakThru Radio, insomnia, quantified self, sleep, sleepart. Bookmark the permalink. Thank you Gabriel, do you have a blog?